Something very odd is happening to your air conditioner. It’s the middle of the summer, but your air conditioner is covered in ice. You’re right to believe that something’s not right! The first thing you should do if you notice that your air conditioner is freezing up is to turn it off. Continuing to run a frozen air conditioner can damage your compressor, and compressor repairs and replacements can be costly. Almost all air conditioner freeze ups are caused by either a lack of refrigerant, or a lack of air flow to the evaporator coils. Continue reading to learn how to troubleshoot and even prevent your air conditioner from freezing up. Although it sounds paradoxical, a lack of refrigerant can actually cause your condenser coil to become too cold and freeze up. Low refrigerant levels often indicate that there is a larger problem with your air conditioner, so it’s best to call an HVAC professional for air conditioning repair if you suspect that this is the problem. If you notice that your air conditioner is freezing up, ask yourself when the last time was that you changed the air filter. Air filters should be replaced after every month of use, so change out the filter and see if that helps. Air filters that are not regularly replaced become clogged with dust and debris, limiting airflow into your air conditioner. A lack of proper air flow can cause your air conditioner to freeze up. If you notice that your air conditioner is freezing up, check on the air flow vents in your home to ensure that they are all open. You should open up any closed registers in order to improve air flow to your air conditioner’s evaporator coil. A lack of air flow to the evaporator coil is the most common reason why air conditioners freeze up. When was the last time that your air conditioner was cleaned and maintained? If it’s been more than a year, the problem could be a dirty evaporator coil. Flowing air must be able to reach the evaporator coils in your air conditioner in order for it to cool effectively. If the evaporator coils are blocked by dirt and debris, your air conditioner will over-cool and freeze up. The fan in your HVAC system serves an important purpose: it blows cool air through your ductwork and into all of the rooms in your home. It also helps to circulate air back into your evaporator coil. If your fan has stopped working, it will feel like your air conditioner is not cooling your home properly. A malfunctioning fan can also cause your air conditioner to freeze up. If you have checked the following items and your air conditioner freezes up again, it’s time to call the professionals. 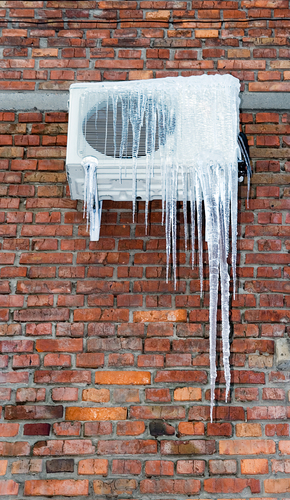 If you continue to run your air conditioner while frozen, you will risk permanent damage to your air conditioner. To schedule an air conditioner repair visit with the seasoned team at the Ray, N. Welter Heating Company, call 612-825-6867.